Based on testing conducted between September 21, 1999 and October 7, 1999. 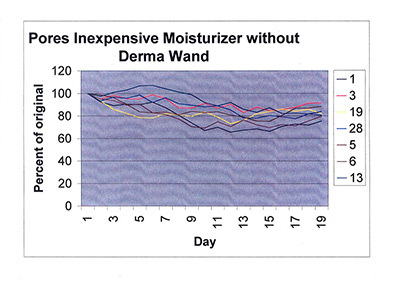 This clinical study was commissioned by RJM Ventures Inc. to determine the effectiveness of the product DermaWand when used in the manner prescribed by the manufacturer. This document is the confidential property of RJM Ventures Inc. and may not be copied or distributed in any way without express written consent of RJM Ventures Inc.
Laser In-Vitro Testing Limited conducted the test as prescribed by the manufacturer and presents the results herein. 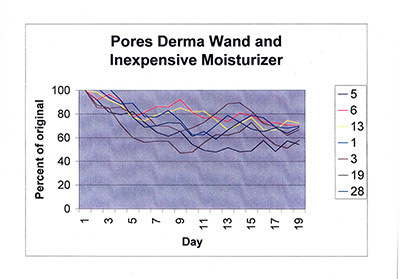 DermaWand Clinical Study: Pore Size, Puffy eyes, and Fine Lines. The DermaWand is condensed version of the high frequency skin care technology that is used by skin care professionals world wide to enhance the appearance of skin. 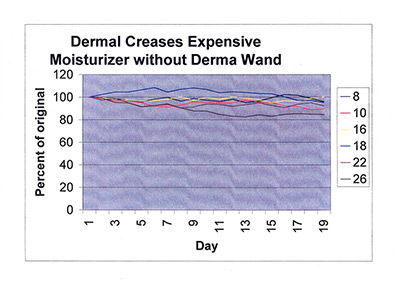 This study is being undertaken to quantitatively establish that published results that are attributed to high frequency are demonstrably associated with the DermaWand. 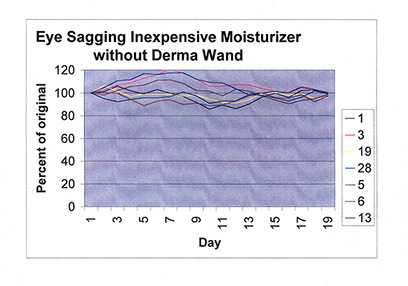 Further, the study attempts to determine the effects of the DermaWand when used with various skin regimes. 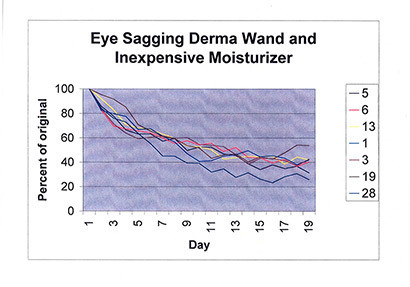 • Improvements in appearance of puffy eyes. 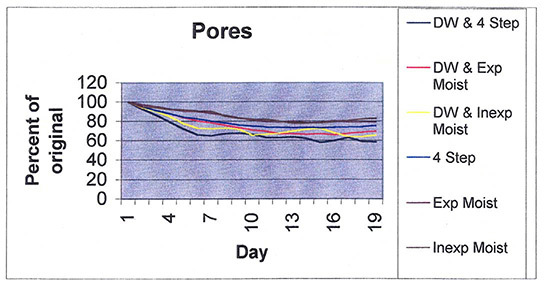 • Improvements in the appearance of fine lines. The study involved 26 subjects, 25 female and 1 male. 1. On the first day the subjects were brought in and randomly assigned a subject number. 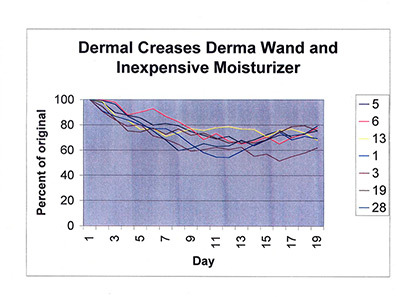 Then each of the participants was evaluated by the esthetician and their dermal characteristics recorded on the participant data sheet. 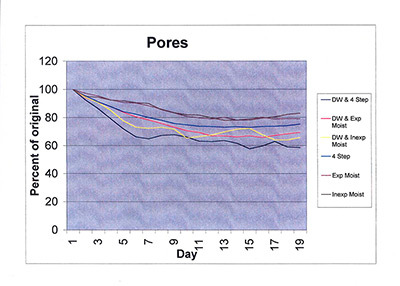 Any proposed participant who showed signs of Cuperous or Rosacea, was eliminated from the study at this time. The original protocol allowed for 28 participants. As only 26 were available, number 13 and 24 were not used. As can be seen, the participants were required to treat each side of their face separately. 2. The participants were each photographed using a Kodak DC 210 digital camera to provide a full face frontal shot. This picture was for identification purposes only. 3. Next, a +6 Tameron lens was put in front of the digital camera lens and a close up picture of the left and the right sides of the face were taken from a fixed distance of 8 inches. 4. The subjects underwent a treatment and the photographs were repeated. For each day of the study, the subject received a treatment in the clinic each morning and was expected to undertake the treatment, on their own, at home each evening. b. 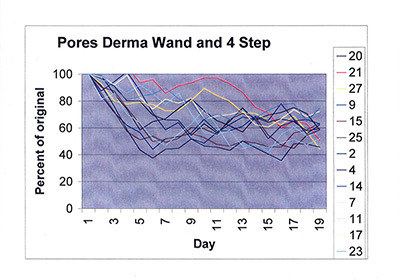 Two minute general sweep with the DermaWand over the appropriate side of the face. 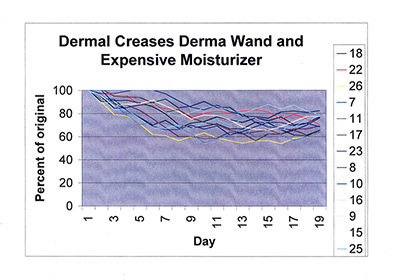 c. Moisturize with appropriate product. 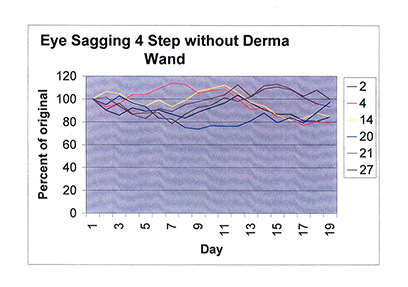 d. Two minute sweep with the DermaWand on appropriate side of the face. e.	Apply appropriate treatment product. 5. The photographs were electronically transmitted to the technician for evaluation. 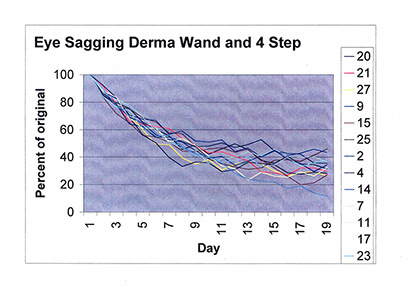 The technician was not informed which data corresponded to which treatment. A. Eye Sagging. The computer program automatically: Draws a line from the corner of the eye to the point of inflection on the bridge of the nose. Measures the length of that line to adjust of irregularities in the rotation of the head. Drops 2 vertical lines from the horizontal and adjusts for any tilt of the head. Measures the distance from the maximum point of the sag to the point of minimum sag. 1. The image is converted to monochromatic. 2.	a custom pixel filter is applied to increase the contrast substantially. 3. the image is reversed to allow for measurement of the high pixels. 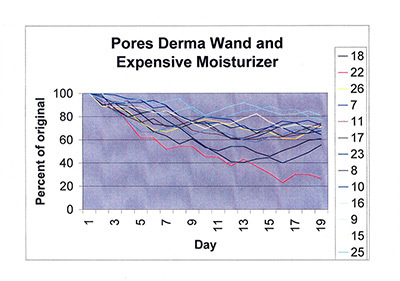 The black area represents the pores. And the area of black is calculated to provide the pore score. 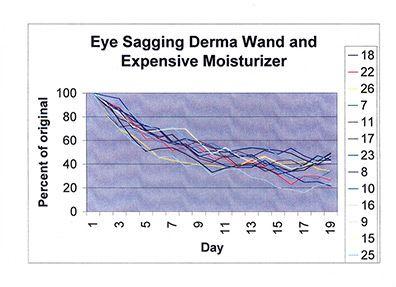 The results for eye sagging are the most dramatic of all of the tests undertaken. 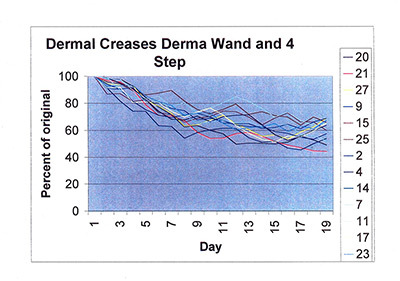 In these tests the use of the DermaWand produced a reduction of over 60% in each of the average samples. 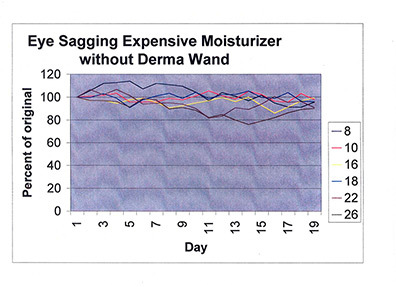 While there was a slight reduction in sagging through the use of the lotions alone, it was almost negligible compared to the DermaWand results. 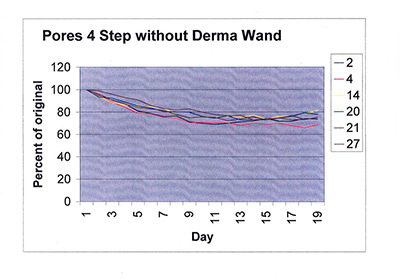 While the results for each of the groups was not as dramatic as the eye sagging experiments, there is a clear improvement, 13 to 17 percentage points, in the use of the DermaWand over the lack of the use of the DermaWand Technology TM. 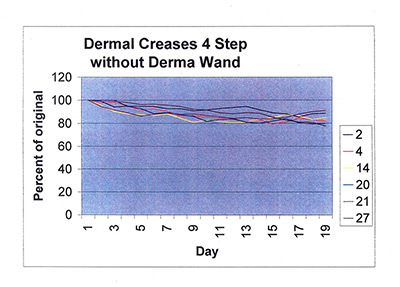 As well, the DermaWand Technology TM, when use with the 4 step program, provided results that were 7% better than either of the other creams. 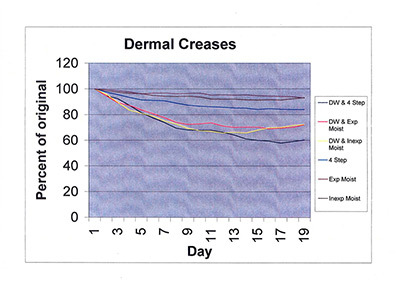 Again, there is a 24 percentage point reduction in the size of dermal crease when the DermaWand is used. 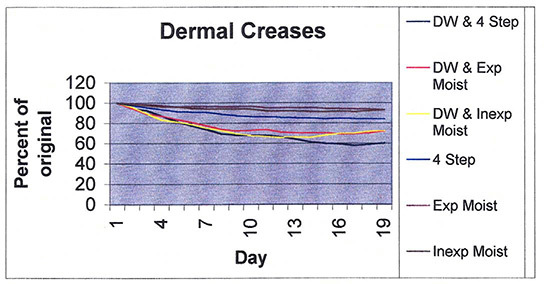 Also, the 4 step program is 10% more effective than either of the creams. Expensive Moisturizer - Clinique - Purchased from local department store. 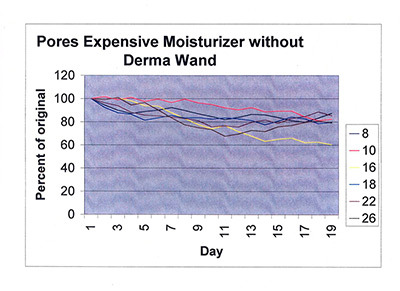 Inexpensive Moisturizer - Plentitued - Purchased from local pharmacy. 4 Step - Tyra Plus 4sytem supplied by Tyra International Inc., Chatsworth, CA.